These dart pens make for an inexpensive handout that will fit right in with the hustle and bustle of any election. in blue or black ink, one or two color imprint, and a variety of eye catching colors. Use these pens to put the finishing touch on those candidacy information tables. Black with Light Blue, Fuchsia, Lime Green, Orange, Purple or Yellow Trim. White with Blue, Purple, Black, Green or Red Trim. Silver with Light Blue, Fuchsia, Lime Green, Orange, Purple or Yellow Trim. Translucent: Purple, Red, Green, Blue or Black with Clear Frosted Trim. Blue, Yellow, Orange, Green or Fuchsia with Black or White Trim. Metallic: Black, Blue, Burgundy, Green or Silver with Black Trim. Light Blue, Fuchsia, Lime Green, Orange, Purple or Yellow with Gray Trim. You need a pen? How about a stylus? Try combining the two with a pen stylus! 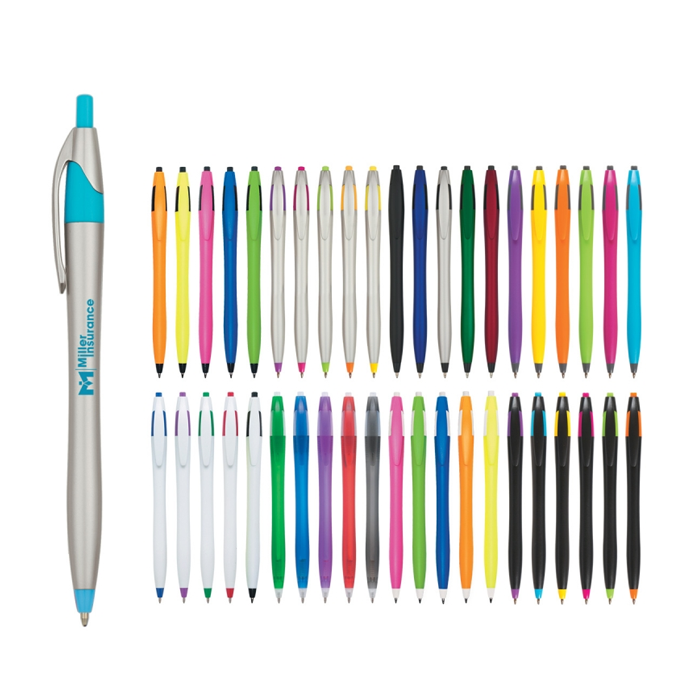 This handy 2 in 1 retractable ball point pen comes in black ink and is in a variety of colors with a one or two color imprint. 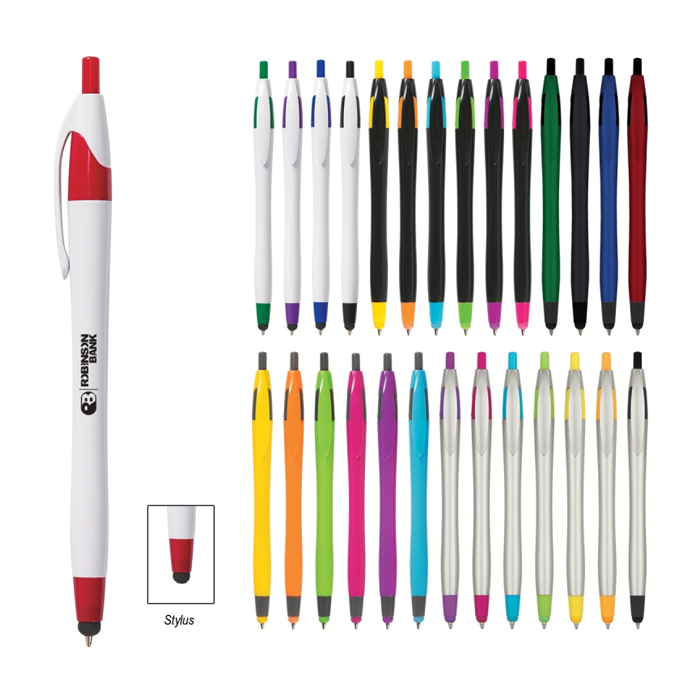 The Dart pen with Stylus will be a great conversation piece at those registration tables this year. White with Blue, Black, Red, Purple or Green Trim. Silver or Black with Light Blue, Fuchsia, Lime Green, Orange, Purple or Yellow Trim. Light Blue, Fuchsia, Lime Green, Orange, Purple or Yellow, all with Gray Trim. Metallic: Black, Blue, Burgundy, Green or Silver, all with Black Trim. Get your Quick Quote and Stay on the Campaign Trail! You'll have a written quote in about 15 mins, and a digital proof in about an hour. We also offer over 800,000 other marketing items. All of our products can be fully customized in order to best represent any idea, event, campaign, business, foundation, fundraiser, or celebration that you are interested in promoting. Call or email us today and we will be very pleased to provide you with an all inclusive price quote on any items you are considering. We are looking forward to the opportunity to earn your business. Please call us at 1-855-645-2564, or you can email us.